Need an awesome way to get you set up for the day? 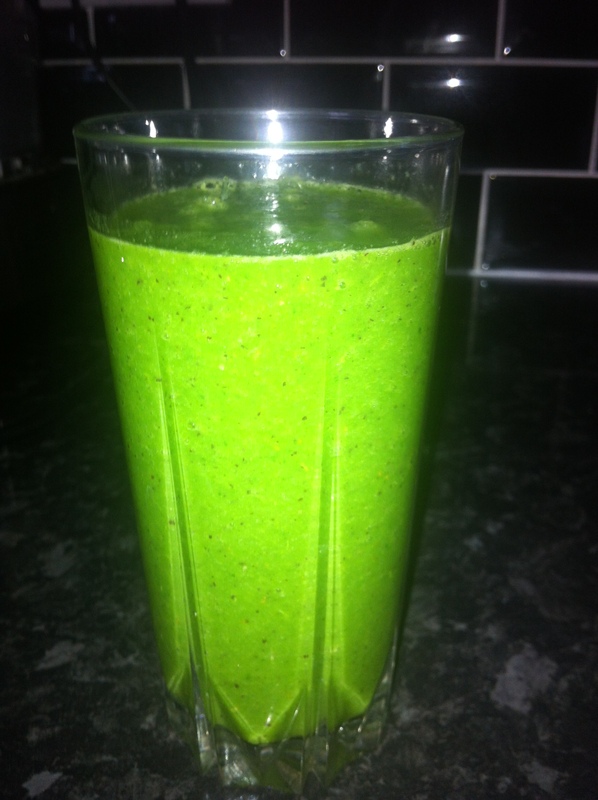 This smoothie will keep you energised and going for quite some time. We all know bananas are full of potassium and boost energy but not only that – they also contain vitamins B and C, beta- carotene, folic acid, magnesium and calcium which all help boost your immune system and lower cholesterol. Kiwis also have similar properties to bananas, as well as contain vitamin E which helps improve skin radiance. They also help cleanse and energize our bodies. Kale has anti-inflammatory, anti-cancer and antioxidant properties. It is packed full of fibre, vitamins A, C, E, K, B vitamins, copper, magnesium, iron, calcium and copper. Place the lot in a blender or smoothie maker and blend. Add some ice instead of water if you prefer it cold. Enjoy! Awesome cleansing juice for the summer, and great at barbecues. This juices refreshes, cleanses and aids digestion as well. Great for the skin too! Put the lot through a juicer or blender. Add another apple if you want more of a sweet taste. 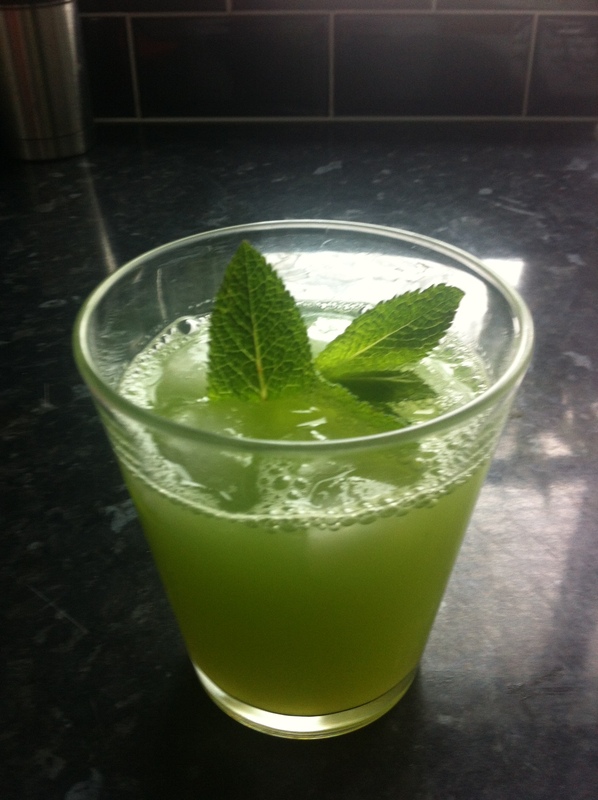 Pour into glasses add some cubes of ice and garnish with sprig of mint. Enjoy! Put everything in a juicer or smoothie maker and blend together. To make more, just add a lot more of the ingredients. If it’s a bit sweet for your taste, dilute with water. Enjoy! Grapefruit: is full of limonoids, vitamin C and many of the detoxing benefits of lemons and limes. Grapefruits reduce bad cholesterol, keeping arteries clean and lower insulin in the body which helps prevent weight gain. Oranges: are high in vitamin A, B6, C, beta-carotene and folic acid. They also contain calcium, phosphorus and potassium. They aid in the destruction of free radicals that are the cause of many ailments, and flush toxins from the body. Celery: is high in vitamin A, B1, B2, B6 and C, and ample supply of potassium, folic acid, calcium, magnesium, iron and essential amino acids. The important minerals in celery juice balance the body’s blood pH, neutralizing acidity and acts as a good post-workout tonic as it replaces the body with its rich minerals. Celery promotes healthy and normal kidney function by aiding elimination of toxins from the body. Lime: All citrus fruits are packed with vitamin C making them a super immune booster. Limes are particularly astringent and refreshing. Even though they are acidic initially they have an alkalizing effect once entering the body. This alkalizing effect is thought by many health practitioners to heal cells and prevent disease. Ginger: is high in antioxidants, contains vitamin C and also has anti-inflammatory properties. Ginger contains ginerol, a compound that is thought to relax blood vessels, stimulate blood flow and relieve pain. Carrots are very good for improving vision and brightening the eyes. Celery is a natural diuretic which aids water retention. 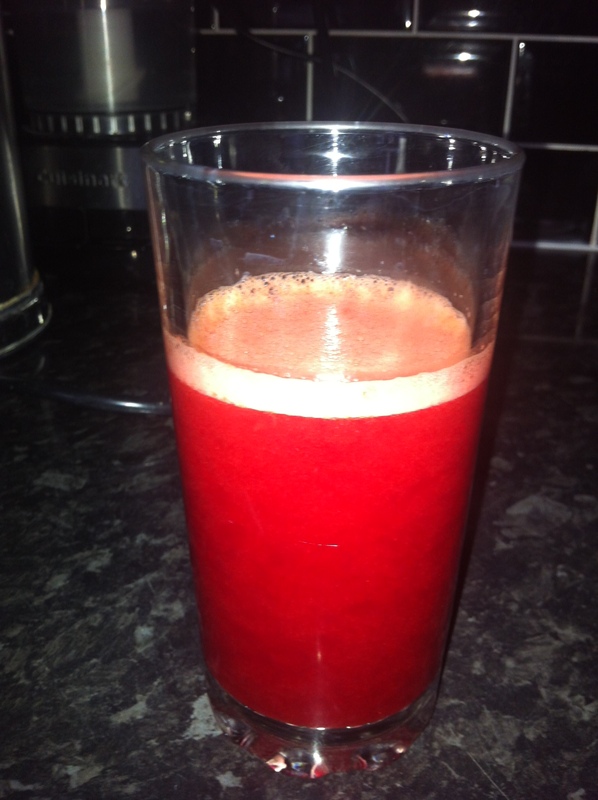 Juice also cleanses toxins from the body and improves signs of skin ageing. 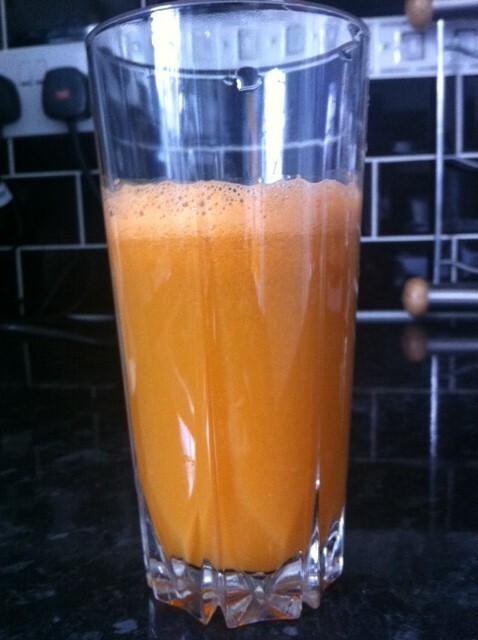 Juice is packed full of vitamins A, B6, C, E, K, beta-carotene, calcium, folic acid, magnesium, sodium, potassium and iron. Juice all ingredients, add ice and enjoy! Serves 2. My best friends in my kitchen! My juicer is my best friend I have fun with almost every day! It’s the Phillips HR1881/00, part of the robust collection. It’s the best thing ever. It comes in 3 parts, the electronic part which houses the filter and crushes your fruit and veg. 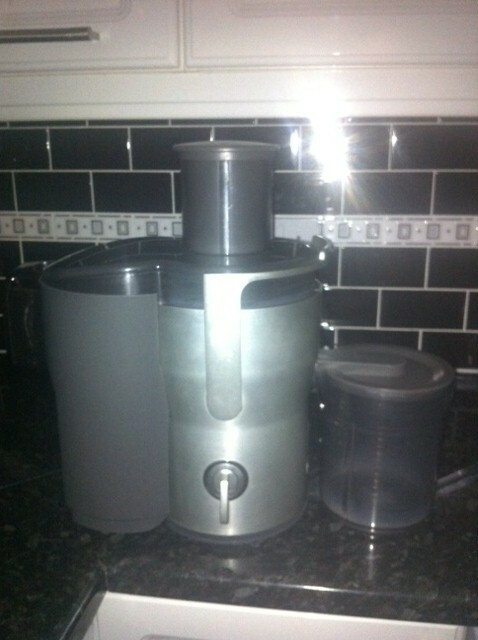 It has a jug to collect the juice and a bin which holds the pulp waste. If you want smooth, clear juice, this is the best juicer you can buy – bit on the pricey side though. It’s also pretty easy to clean. 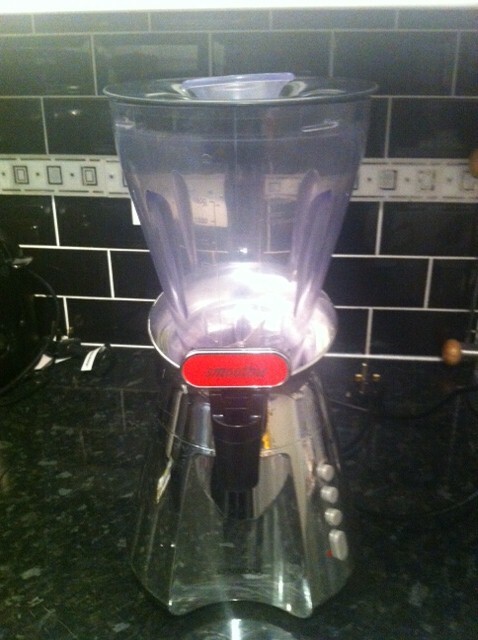 Now, I currently use the Kenwood Smoothie Maker SB266. It’s not the best on the market but it does the job for now. I sometimes want to have all the bits from the fruit and veg in a glass and there are some vegetables and fruits you can’t pass through a juicer like mango and avocado. 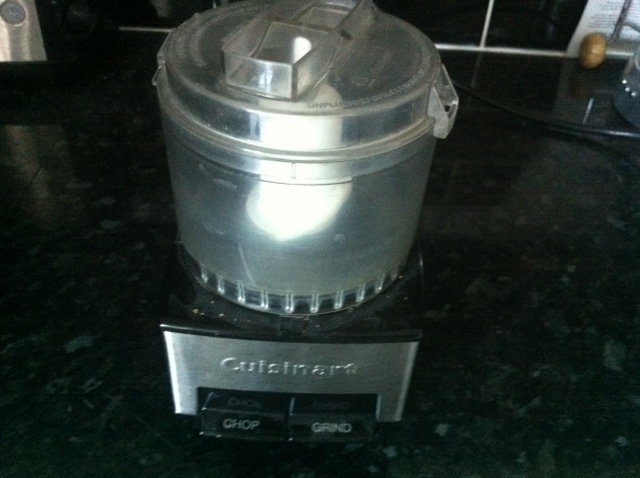 I will eventually invest in the Vitamix juicer/blender, does all the jobs in one! Now this little food processor from a company called Cuisinhart, is I think one of the best investments I’ve ever made on kitchen gadgets. I found it in Fenwicks department store at Brent Cross in London. It grinds and chops everything from herbs and spices like garlic and cardamom seeds, to vegetables like onions, tomatoes or whatever little thing you want to put in it. I had a look for it on Amazon and surprise, surprise, it’s on there!